Santa Cruz de la Sierra (Agenzia Fides) – “This Congress re-connects with the one celebrated in Maracaibo and with previous Congresses representing significant steps in missionary commitment of this great Continent. These congresses are also part of the missionary plan of Christ who first sent his disciples to prepare the way in the villages he was about to visit and then broadened the field, sending them out to the whole world to announce the good news of the Gospel”. This was said this morning during the ceremony to inaugurate the Fifth American Mission Congress (CAM 5), by Cardinal Fernando Filoni, Prefect of the Congregation for the Evangelisation of Peoples, special envoy of the Holy Father Francis. “God too has a plan and especially on this American continent– the Cardinal continued – to which, as John Paul II so often said, the Church gave great missionary impulse during the second half of the previous millennium”. In his opening address, Cardinal Filoni underlined that reflections on the missionary response of Church on the American continent regarding the challenges of our times will re-echo again during the Special Assembly of the Synod of Bishops for the Pan-Amazon Region, in October 2019, to be celebrated in coincidence with the Extraordinary Missionary Month – the Cardinal Prefect explained – convoked by the Pope to mark the centenary of the Apostolic Letter Maximum illud, issued by Benedict XV, with which he decided to «re-qualify evangelically» ad gentes missionary activity, «purifying it from any colonial encrustation», removing « nationalistic expansionistic mire which had caused so many disasters ». The fruits of that special impulse given to mission ad gentes by Benedict XV, were abundantly recognised and taken up by the Second Vatican Council of which the Ad Gentes Decree was the fundamental pillar and opened the way for two successive unforgettable documents, also pillars in the great and praiseworthy development of missionary activity in recent decades: the Apostolic Exhortation Evangelii nuntiandi (1975) by Paul VI, and the Encyclical Letter Redemptoris missio (1990) by John Paul II. Ulterior developments in our day and lastly, the Apostolic Exhortation by Pope Francis, Evangelii gaudium, in which the Holy Father sets the whole Church in a permanent state of evangelization. This Congress, therefore, is called to take up the vision of the Pope, to embrace it and adapt it to the rich variety of situations on the American continent”. The Cardinal then mentioned three ambits of action in the work of evangelization indicated by Pope Francis: pastoral care for the spiritual and moral growth of believers, the ambit of baptised persons not living according to the exigencies of their baptism, mission Ad gentes towards those who do not know Christ or have rejected Him. “These three ambits are present in the Americas and represent today a major challenge for the Church” he underlined. 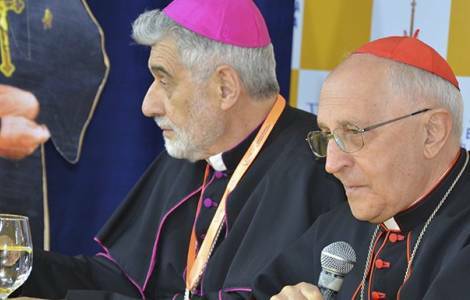 Before concluding his opening message, Cardinal Filoni warned of the danger “of losing the newness of the Gospel and the enthusiasm of missionary calling and succumbing to personal infidelity or the crisis of efficiency and appearances ”. “We must beware of the logic of the algorithm, thinking that efficiency-ism solution-ism is the right logic to follow – he admonished -. Not even lowering the level of generosity is a way to solve, for example, the problem of few missionary vocations; instead it is faced by increasing authentic mission pastoral, generous sharing of apostolic personnel between rich Churches and the poorer ones and, lastly, letting ourselves be inspired by deep generous love for serving communities deprived of the news of the Gospel”.